We left for this trip one month ago today. But I wanted to make sure I did this vacation justice on the blog, and as you’ll see, we did a lot. More than a usual vacation for us. 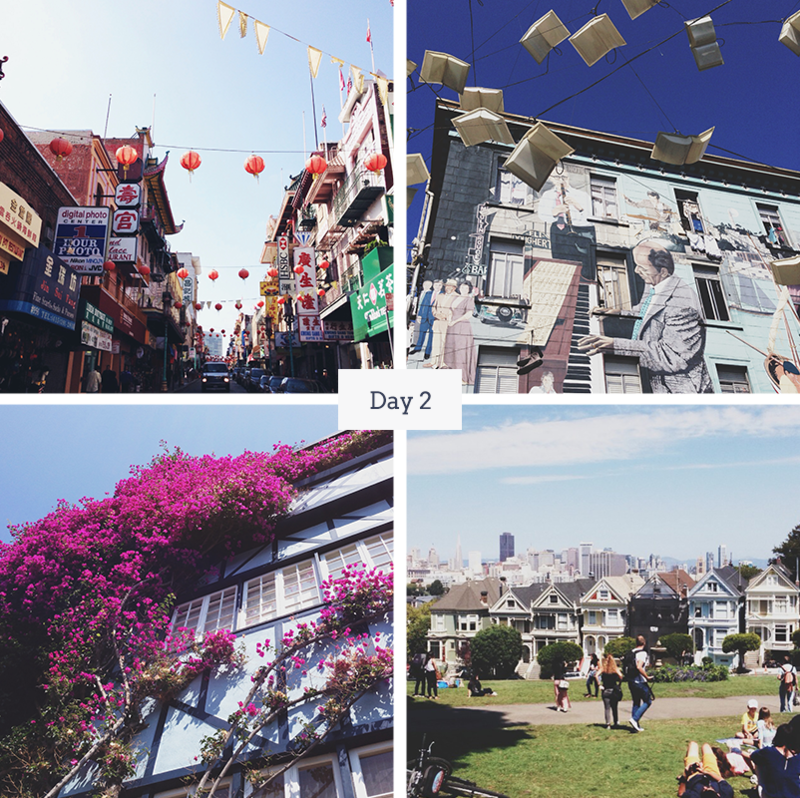 Reading blog posts from other people was hugely helpful in planning this trip for me, so I wanted to make sure I shared what we did. So here we go! This year we did something that was pretty far outside of our familial comfort zone, and hopped on a plane to San Francisco! My mom moved around a lot as a kid, but she lived in a suburb of San Francisco for the longest, and when asked where she grew up that is where she will always tell you. One of her goals has always been to fly all of us out to the city and experience her favorite place that she’s lived. As we got to the airport, I realized that the last time I was on a plane with my brothers was in 2000 when we all flew to Disney World. There was definitely some risk involved in this trip- going from everyone being able to do whatever they want, whenever they want to being tourists together for a week was going to be a challenge. That being said, I think it went as well as it possibly could have gone- we all got along for the most part and we got to see lots of cool things! When researching our trip, we knew we wanted to rent a home instead of staying in a hotel. Including our significant others, our family consists of seven adults. My dad also has celiac disease and my brother is an incredibly picky eater. We knew eating at restaurants would be challenging (not to mention expensive) and were hoping to be able to eat in if we wanted to. Originally, we selected a townhouse that we found on vrbo.com, but I think was actually rented by Boutikia. However, about eight weeks before our trip, we got an email saying that the owners had decided not to rent the property anymore, but that they had another comparable property available the same week. 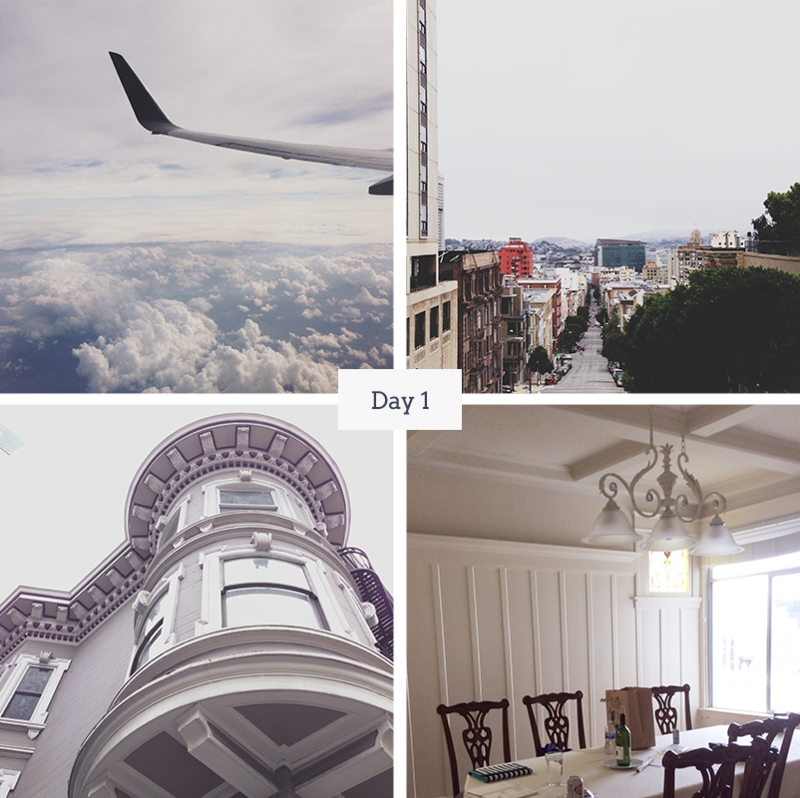 We just went with it, and wound up staying in a four bedroom apartment in Nob Hill. It was a really cool old apartment, even though our street was nuts. We got in around 9 on Saturday night, and I was helping my dad navigate to the property. When he turned onto our street, it was seriously terrifying. Like going down the hill on a roller coaster (and I actually like roller coasters.) It was so steep that walking up and down it (or pulling up in front to unload) was a challenge, but overall it worked out fine for us. Not perfect, but definitely a cool place to stay! The first day didn’t really go as planned. Lauren tipped me off that there was a large music festival happening near Golden Gate Park over the weekend, so we thought it would be a good idea to knock out one of our day trips on Sunday. We picked Muir Woods. This was bad planning on our part. It turns out that the park gets super crowded on weekends, making it really difficult to find parking. 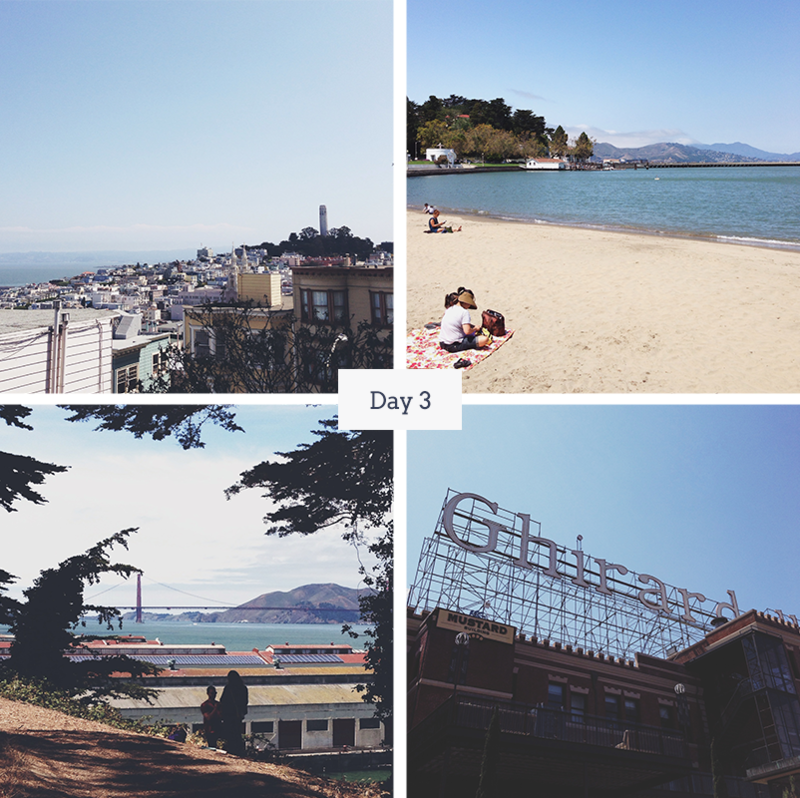 It wasn’t a total bust- we drove through the city, across the Golden Gate Bridge, and got to drive by Sausalito and some of Marin County. The ride to Muir Woods itself was a little scary (I’m admittedly a wimp about that sort of thing) and my brother’s girlfriend gets car sick, so she was pretty miserable at that point. We decided to do the redwoods another day, and instead head to Danville, the town where my mom grew up. I didn’t take many pictures of the town because we were in the car, but it was really cute. We drove by my mom’s old house and her schools, and stopped at a grocery store so that we could cook dinner when we got back. Then we headed back into the city and ate dinner in our apartment. Thanks to a recommendation from Anna, most of my family did The Real SF Tour on Monday. I wish there was a DC version of this tour, because I think I would learn a lot. It was so cool! We ate lunch at Barneys in the Marina District- it was awesome! We all got different kinds of fries (I opted for sweet potato, duh) and accommodated my gluten-free dad and my chicken-only brother. Score! After the tour, we were so wiped out. We wound up all doing our own thing for dinner, and for me, Brian, and my dad, that meant walking two blocks to Trader Joe’s and picking up something quick. It was perfect after our long day of walking. My brother was planning to propose (!!!) on our trip, so Tuesday wound up being all about making that happen. My mom and I woke up early and headed to the Golden Gate Fortune Cookie Factory to get special fortune cookies made for my brother’s proposal. I wound up writing “Will you marry me?” on two fortune cookies and watch them get folded into the classic shape. It was so much fun! We decided to take my brother and his girlfriend on parts of the tour we’d gone on the day before, since they hadn’t been with us. My brother had suggested that the two of them get sandwiches and have a picnic at Fort Mason. The rest of us were going to continue on to Fisherman’s Wharf for lunch since we’d already been up there. But really, Brian and I followed them up there, Secret Squirrel-style, so that we could document the whole thing. It went as well as possible! Brian actually got a really good video of the whole thing. I kind of stood awkwardly a ways away from them, knowing that if Liz turned around we would be busted. But she didn’t, and it was really fun! Afterwards, we left them to finish their picnic and grabbed lunch at Fisherman’s Wharf. Then we met up with my parents and the newly-engaged at Ghiradelli Square for a little ice cream. Okay fine, the ice cream wasn’t little. We headed back to the apartment in the afternoon, and then to Puccini and Pinetti (thanks to Lauren for the recommendation!) for a celebratory dinner. They were great- we were in and out in an hour and the food was really good! I give you mad props if you’ve made it this far. I’m going to break this monster trip into two posts, stay tuned for the rest tomorrow! Eeep! How fun! Congrats to your brother and his new fiancée! I’ve never made it to San Francisco, but your trip is sure making me want to get out there sometimes soon. :) I had so much fun going through these pictures, I’d love to go back someday! San Fran sounds and looks amazing! I’ve always wanted to go…. hopefully someday! Can’t wait to hear about the rest of your trip! And congrats to your brother!! Yeah, the tour was awesome! It sounds touristy, but it actually allowed us to see a lot of non-touristy things that we otherwise wouldn’t have seen. Totally recommend it! What a cool idea to rent a home in San Fran. We were out there in November and loved the area! Glad you had a good time. Yeah, it was really cool- I know they have that in other cities too, I would totally rent something like that again on future trips!